The August 1st New York Times carries the latest Paul Krugman opinion piece, “Defining Prosperity Down“. He is depressed because it is dawning on him that the elite is in the process of redefining the level of structural unemployment that is normal to adjust to the significant likelihood that we will be living with 9%+unemployment on into the future. 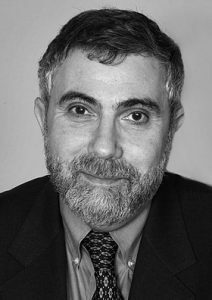 Where has Krugman been? He is old enough to remember that back in the 1960s structural unemployment was defined in college textbooks as 3%. Then during the later years of the Nixon regime this got redefined to 6%. This to meet the emerging pattern of chronic unemployment and no real growth in wages for working and middle class families that has now characterized the last 40 years in the US. Where has Krugman’s head been? Paul Samuelson author of the most widely used college introduction to economics was on the faculty at MIT when Krugman studied there in the 1970s. Has Krugman not checked the shift in the definition of structural unemployment from one edition to the next during those years? Krugman is right that the Obama administration and the Congress has no real interest in the laggard performance of the economy when viewed for the bulk of the population in the working and middle classes. What is unacceptable is not to recognize and clearly state that the elites in the US have not cared about this matter since the days of LBJ and earlier. How can one explain that not only has the definition of structural unemployment crept inexorably higher, but the stagnation in real incomes of average Americans over the last forty years has roused no effective policy directions under either the Republicans or Democrats. The elite has been busy over the past forty years fighting so-called wars against various boogeymen, the Soviets, dominoes, drugs, communism, terrorism, and so on. The elite has been busy sustaining a global military machine and imperial presence that has consistently placed US spending on armaments in the range of 40% to over 50% of total world spending on war. The elite has been engaged in a religious venture called ‘free market capitalism’ for this whole period. This war, aided by the religious rhetoric of Milton Friedman and his cabal of coreligionists at U. Chicago, dismantled the protections in the financial markets build up after the debacle of the Great Depression. What is the elite has been doing is taking care of its patrons. The rich have gotten richer during this whole period and enormous so in the last twenty years. But the patrons are not fooled by the religious free market rhetoric. They have gotten richer through the fleecing of the economy through predatory tax breaks, tax havens, and the protected gambling of the ultra rich in the financial market places of Wall St. and The City.